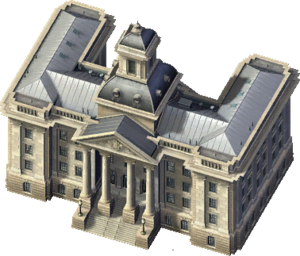 The Medium City Hall is a Civic Building that provides a Landmark Effect and some Civil jobs to your Sims. The Medium City Hall was probably intended to be an automatic direct upgrade of the Small City Hall at an arbitrary population point and upgraded to the Large City Hall itself at another arbitrary point. Only the Small City Hall was ever given a reward script by Maxis. The Medium and Large city halls are both functionally complete. It appears that it was originally intended to automatically upgrade in the way that Airports and Seaports can. MrTrusage fixed this by implementing them as three separate lots at Simtropolis. This page was last modified on 7 February 2014, at 07:29.